Helsinki Classic Yacht Week 2013 - Sail in Finland! The Helsinki Classic Yacht Week 2013 featured classic, wooden sail and power boats like never before. The center of the week’s activities were on the Suomenlinna Fortress island. This year showcased classic boats in the harbor of the Suomenlinna Yacht Club, there was a small-scale exhibition by the Forum Marinum museum in Turku on the Åbo Båtwarf boat yard and the Baltic Sea Action Group and the newly established classical yacht register in Finland presented their activities. Here are a few video from the main Helsinki Classic Yacht week events. The Champagne regatta is a two day event mainly for the boats participating in the Baltic Classic Circuit. The regatta was organized by the HSS yacht club in Helsinki. The HCYW events in centered around the Suomenlinna Yacht club’s home harbor and the Suomenlinna Shipyard. Boats participating in the Viaporin tuoppi race could arrive early and be exhibited for people to admire. Viaporin Tuoppi (also on Facebook here) is the biggest race for wooden sailing boats in the Nordic countries. It is arranged every year by the Suomenlinna Yacht club. 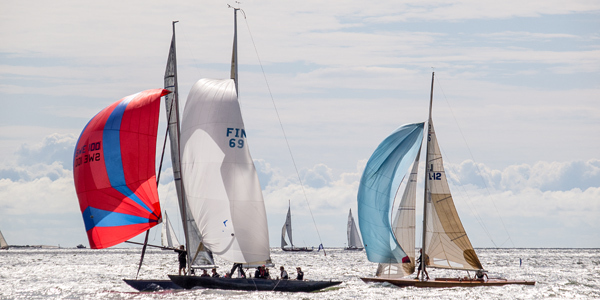 In 2013 the race attracted some 160 boats of all conceivable types in Finland and the Baltic. The biggest single class of yacht were the Folkboats with some 30 boats starting. For some photos from the Viaporin Tuoppi 2013 race, check out this album on the Sail in Finland FB page!